It is easy, and it is a joy to travel with train in Holland. 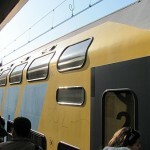 There are trains departing all day around, so it is very seldom that you have to wait for a long time for a train to depart to your selected destination (at least if you travel within Holland from Amsterdam). The main trainstation, Amsterdam Centraal, is located in the centre of Amsterdam, and from here you can reach almost anywhere in Holland within one-two hours. It can not be considered cheap to travel with train in the Netherlands, but it is effective, so that kind of makes up for the high prices for those who need to pay full price.